SAN FRANCISCO — Businesses in the South Park district of San Francisco generally sell either Web technology or sandwiches and burritos. Bespoke Innovations plans to sell designer body parts. Scott Summit, co-founder of Bespoke Innovations, with a prosthetic limb. Charles Overy, founder of LGM, with a model of a resort in Vail, Colo. “We used to take two months to build $100,000 models,” he said, adding that now they cost about $2,000. The company is using advances in a technology known as 3-D printing to create prosthetic limb casings wrapped in embroidered leather, shimmering metal or whatever else someone might want. Scott Summit, a co-founder of Bespoke, and his partner, an orthopedic surgeon, are set to open a studio this fall where they will sell the limb coverings and experiment with printing entire customized limbs that could cost a tenth of comparable artificial limbs made using traditional methods. And they will be dishwasher-safe, too. A 3-D printer, which has nothing to do with paper printers, creates an object by stacking one layer of material — typically plastic or metal — on top of another, much the same way a pastry chef makes baklava with sheets of phyllo dough. The technology has been radically transformed from its origins as a tool used by manufacturers and designers to build prototypes. These days it is giving rise to a string of never-before-possible businesses that are selling iPhone cases, lamps, doorknobs, jewelry, handbags, perfume bottles, clothing and architectural models. And while some wonder how successfully the technology will make the transition from manufacturing applications to producing consumer goods, its use is exploding. A California start-up is even working on building houses. Its printer, which would fit on a tractor-trailer, would use patterns delivered by computer, squirt out layers of special concrete and build entire walls that could be connected to form the basis of a house. It is manufacturing with a mouse click instead of hammers, nails and, well, workers. Advocates of the technology say that by doing away with manual labor, 3-D printing could revamp the economics of manufacturing and revive American industry as creativity and ingenuity replace labor costs as the main concern around a variety of goods. “There is nothing to be gained by going overseas except for higher shipping charges,” Mr. Summit said. A wealth of design software programs, from free applications to the more sophisticated offerings of companies including Alibre and Autodesk, allows a person to concoct a product at home, then send the design to a company like Shapeways, which will print it and mail it back. “We are enabling a class of ordinary people to take their ideas and turn those into physical, real products,” said J. Paul Grayson, Alibre’s chief executive. Mr. Grayson said his customers had designed parts for antique cars, yo-yos and even pieces for DNA analysis machines. “We have a lot of individuals going from personal to commercial,” Mr. Grayson said. Manufacturers and designers have used 3-D printing technology for years, experimenting on the spot rather than sending off designs to be built elsewhere, usually in Asia, and then waiting for a model to return. Boeing, for example, might use the technique to make and test air-duct shapes before committing to a final design. Depending on the type of job at hand, a typical 3-D printer can cost from $10,000 to more than $100,000. Stratasys and 3D Systems are among the industry leaders. And MakerBot Industries sells a hobbyist kit for under $1,000. Moving the technology beyond manufacturing does pose challenges. Customized products, for example, may be more expensive than mass-produced ones, and take longer to make. And the concept may seem out of place in a world trained to appreciate the merits of mass consumption. But as 3-D printing machines have improved and fallen in cost along with the materials used to make products, new businesses have cropped up. Freedom of Creation, based in Amsterdam, designs and prints exotic furniture and other fixtures for hotels and restaurants. It also makes iPhone cases for Apple, eye cream bottles for L’Oreal and jewelry and handbags for sale on its Web site. Various designers have turned to the company for clothing that interlaces plastic to create form-hugging blouses, while others have requested spiky coverings for lights that look as if they could be the offspring of a sea urchin and a lamp shade. His company can take risks with “out there” designs since it doesn’t need to print an object until it is ordered, Mr. Kyttanen said. Ikea can worry about mass appeal. 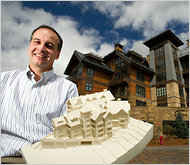 LGM, based in Minturn, Colo., uses a 3-D printing machine to create models of buildings and resorts for architectural firms. Now, he said, he is building $2,000 models using an architect’s design and homegrown software for a 3-D printer. He can turn around a model in one night. Next, the company plans to design and print doorknobs and other fixtures for buildings, creating unique items. “We are moving from handcraft to digital craft,” Mr. Overy said. But Contour Crafting, based in Los Angeles, has pushed 3-D printing technology to its limits. Based on research done by Dr. Behrokh Khoshnevis, an engineering professor at the University of Southern California, Contour Crafting has created a giant 3-D printing device for building houses. The start-up company is seeking money to commercialize a machine capable of building an entire house in one go using a machine that fits on the back of a tractor-trailer. The 3-D printing wave has caught the attention of some of the world’s biggest technology companies. Hewlett-Packard, the largest paper-printer maker, has started reselling 3-D printing machines made by Stratasys. And Google uses the CADspan software from LGM to help people using its SketchUp design software turn their creations into 3-D printable objects. At Bespoke, Mr. Summit has built a scanning contraption to examine limbs using a camera. After the scan, a detailed image is transmitted to a computer, and Mr. Summit can begin sculpting his limb art. He uses a 3-D printer to create plastic shells that fit around the prosthetic limbs, and then wraps the shells in any flexible material the customer desires, be it an old bomber jacket or a trusty boot. Mr. Summit and his partner, Kenneth B. Trauner, the orthopedic surgeon, have built some test models of full legs that have sophisticated features like body symmetry, locking knees and flexing ankles. One artistic design is metal-plated in some areas and leather-wrapped in others. “It costs $5,000 to $6,000 to print one of these legs, and it has features that aren’t even found in legs that cost $60,000 today,” Mr. Summit said. If you remember, end of August we announced the upcoming ‘How Do They Do It’ on Discovery Science Channel in US and UK. The UK channel aired the full program including the Objet part of the Burton Snowboards story. You can click on the link below to watch the program in full. The snowboard story starts at 11:52, and 3D Printing and Objet starts at 18:20. Below again — for those who were not exposed to the story — some images of the ‘Making of the Movie’,. Rehovot, Israel, September 7, 2010 – Objet Geometries Ltd., the innovation leader in 3D printing for rapid prototyping and additive manufacturing, today announced the new price of $24,900* for its market-proven Alaris30™ desktop 3D printer. The price, effective as of today, September 7, 2010, makes the Objet Alaris30 the only sub-$25,000 3D printer capable of printing high-definition, high-quality prototypes at an affordable price. Objet’s Alaris30 brings the patented PolyJet 3D-printing technology used in Objet’s professional and office systems to the desktop. It is the first office-friendly desktop system to print true-to-life parts. The ability to create prototypes that accurately represent the desired end-product allows crucial decisions to be made early in the product development life cycle, saving valuable time and costs. The Objet Alaris30 has been honored with a PlastPol 2009 Award. The recent T.A. Grimm & Associates, Inc. 3D Printer benchmark study found that in the sub-$25,000 3D printers market range, the Objet Alaris30 offers the best quality with the highest total accumulated marks for durability, surface finish, dimensional accuracy, and feature details. price point provides price-sensitive buyers with an excellent option to benefit from the productivity gains offered by in-house printing with the highest quality prototypes,” concluded Gans. Objet Alaris30 is used by hundreds of customers in multiple industries, worldwide. *The Objet Alaris30 is available for purchase via the company’s worldwide offices or its global network of distributors. The recommended retail price is $24,900 – US dollars – (€19,900 in Europe; other international pricing may vary) and excludes options, shipping, local taxes and duties. For details, please contact your regional Objet office or Objet authorized distributors. 3D printing applications are continuing to develop as the technology expands. Designers and engineers find it very useful in the creating of design prototypes. Not only does 3D printing technology offer many useful design features, but prototypes can consist of many different kinds of model materials. Currently, fabrication materials used to produce prototypes range from resins, polymers and plasters, many new ones may be on the horizon as well. Depending on the scope of the prototype to be produced will determine which 3D printing fabrication materials designers prefer. Key factors that can influence the choice of materials used in 3D printing prototypes are model durability, expected lifespan, and the complexity of design. Many companies rely on the use of prototypes and models produced by 3D printing for the purpose of conducting product, and focus group testing. The test groups are looking for design preferences from consumers or end-users. The feedback received is incorporated into the design during this stage of the process. The data gained is used to make changes to the product as it is prepared for manufacture. 3D printing is a crucial tool for quickly making cost efficient design changes, and the ability to rapidly produce a new prototype. 3D printing applications for marketing and design function is able to cut the time necessary for producing a workable prototype. Time and cost savings using 3D printers can be as much as two-thirds. Prototypes produced, tested and redesigned utilizing 3D printing is highly efficient because designs can be easily changed until the engineering is ideal. Instead of gaining performance data as a result of field failure, data can be easily gained in the design process. Inexpensive materials such as resins and polymers used in 3D printing offer the most durable prototype models, and also reduce cost. Research and development in 3D printing technology continually advances with new materials being developed all the time. This technology plays an important role in the efficient production of prototypes for research and product development. The advantage of using (CAD) software in 3D printing technology stands in stark relation to traditional prototype technology. Traditional prototyping technology employed plastic formers to create models. These required large and bulky platforms and a major financial investment for design, or engineering firms. 3D printing systems that are not only more compact, but are cost efficient to purchase and operate also. The technology has reduced the set up time, and operation requirements are easier too. This has made the technology a popular choice for many models and toy manufacturers. 3D printing stands on the forefront of many new product markets, fabrication materials, and hardware applications, both for the business and consumer markets. Advancing technologies are steadily developing and many advantages in advanced hardware, software and fabrication materials used in available rapid prototype systems have resulted. 3D printing advancements allow for the faster and more cost efficient prototype, and fabrication model. 3D printing advantages also include the elimination of expensive tooling, manpower, and the costs associated with the creation of design prototypes. All of these 3D printing advantages help firms to create the models necessary in order to bring their products to market. Innovative new technology-changing the manufacturing sectors, with the touch of a button. Driven by passion for Design and Engineering, one company is revolutionizing multiple sectors, with an innovative new product. The future has arrived and is about to prove itself beneficial to multiple sectors. Proto3000 Inc. is a 3D Engineering Solutions company that has successfully made their mark with product development in this market. With passion for excellent customer service, this organization provides innovative technology to manufacturing professionals. Utilizing advanced 3D Engineering Technologies, Proto3000 accelerates the product development process. “3D Computer Aided Design (CAD), Rapid Prototyping and Handheld 3D Laser Scanning technologies can be used synergistically to provide a cost efficient product development process” according to Eyal Geiger, Engineering Manager at Proto3000. Product development is a key aspect of any market, and to ensure the success of the company or product, quality assurance and testing are ever growing necessities. Proto3000 takes this necessity to the next level and combines the latest technology along with ease of use. The product development process begins when several conceptual drawings are developed; they are then designed in 3D CAD. Rapid Prototypes of the CAD data are built and then utilized for field testing in order to confirm the 3D CAD data. Proto3000 presents a cost effective solution; Reducing costs and keeping quality at its highest through the use of the 3D Laser Scanning for inspection purposes. The 3D Scanner digitizes the part surface in real-time to its computer software. The original 3D CAD data and the digitized surface mesh are then merged to produce full inspection reports. Further post-processing of the scanned data can be used for Reverse Engineering. This allows the product to be redesigned and improved prior to final inspection. This action alone can save weeks of laborious and cost intensive processes prior to production. Based out of their office in Concord (Ontario) Proto3000 is going above and beyond the call of duty. This organization helps customers use and maintain the product, in addition to the professional services they offer. What does this mean to clients? This means quality, safety, dedication, and a stepping stone to a new generation of handheld 3D laser scanning and its multiple uses. Proto3000 has managed to assist their clients to save money and eliminating unnecessary production wait times. By combining customer service, product knowledge and passion for the industry, Proto3000 has proven to be a growing success in this industry. Proto3000 recently exhibited its handheld 3D Laser Scanner and Rapid Prototyping Processes at this year’s Canadian Manufacturing and Technology Show which took place from October 19 – 22, 2009. These trades were received with great success and are a staple for manufacturing and product development services. For further questions or comments, as well as media inquiries please email info@proto3000.com or call 905-738-1779.